The Witches remake has added several additional members to its cast, including Oscar-winner Octavia Spencer. We first got wind of this new adaptation of the beloved Roald Dahl novel last summer and it's been slowly coming together behind the scenes ever since. Things seem to be heating up a bit more recently, as casting has started taking place for Robert Zemeckis' next directorial effort. Now, we have word that one of Hollywood's most respected actresses, in addition to a couple of newcomers have boarded the project. 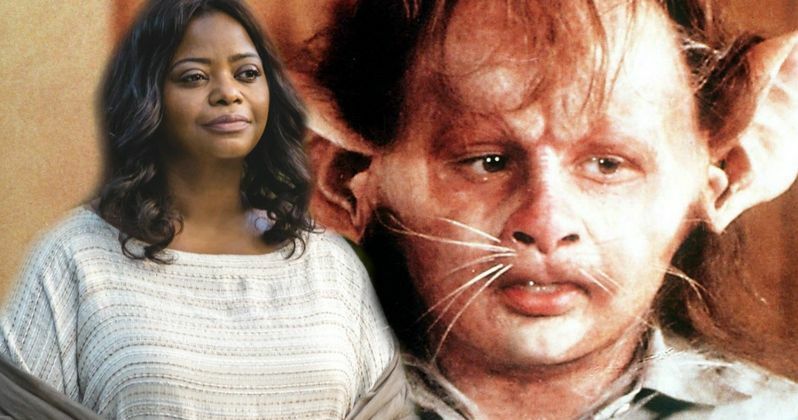 According to a new report, Octavia Spencer is in talks to star in The Witches, alongside newcomers Jahzir Bruno and Codie-Lei Eastick. Should the deals make, Spencer will play the grandmother to Bruno's character, while Eastick will portray another young boy who has a run in with the titular witches. Robert Zemeckis is co-writing the screenplay, in addition to directing, alongside Kenya Barris (Black-Ish). Their take is said to be much more faithful to the source material, when compared to the previous 1990 adaptation, which was directed by Nicole Roag. It was previously revealed that fellow Oscar-winner Anne Hathaway has been tapped to star as the Grand High Witch. The role was previously played by Anjelica Huston. Octavia Spencer represents yet another huge get for the project. Spencer won an Oscar for her work in 2012's The Help. She's was nominated for additional Academy Awards in the field of Best Supporting Actress in 2017 for Hidden Figures and 2018 for her role in the Best Picture winner The Shape of Water. Some of her other notable projects include the Divergent movies, Snowpiercer, Gifted and a recurring role in the series Mom. Spencer is also set to star in Robert Downey Jr.'s The Voyage of Doctor Dolittle. Behind the camera, Spencer also serves as an executive producer on Green Book, which is nominated for Best Picture at the Oscars. The Witches was originally published in 1983. The story centers on a young boy who inadvertently stumbles upon a witch coven and subsequently spies on them. Through his spying, he learns of a plan they've hatched to turn all children in the world into mice. The young boy is discovered by the witches, who, as punishment, turn him into a mouse as a means to test out their plan. Following the incident, he then teams up with several humans in an attempt to fight these witches and halt their nefarious plan. Guillermo del Toro (The Shape of Water), who penned a previous draft of the screenplay, and Alfonso Cuaron (Roma) are producing this new adaptation for Warner Bros. Robert Zemeckis, whose credits include Back to the Future, Forrest Gump and Cast Away, is looking to bounce back after his most recent effort, Welcome to Marwen, failed to connect with critics and bombed at the box office. The Witches is set to hit theaters on October 16, 2020. We'll be sure to keep you posted as any additional details on the project come to light. This news was first reported by Variety.